Expect traffic to your site with Compucast. All of our web sites are uniquely designed and created with SEO in mind. They include features such as content management systems, reservations engines, auctions …any custom programming needed. We launched Compucast Web Media in November of '94 as more and more people began asking us to design sites for their businesses and promote them online. That was just the beginning! Today, Compucast Web Media designs sites for all businesses, and specializes in the hospitality industry with several flagship web sites designed to send traffic to the New Orleans businesses it represents (including NewOrleansRestaurants.com, NewOrleansKids.com, NewOrleansCoupons.com, MardiGrasNewOrleans.com, BestNewOrleansHotels.com, WeddingsInNewOrleans.com) ... all featuring the positive side of New Orleans ... and assisting visitors, tourists, and business travelers planning their vacations to the area. 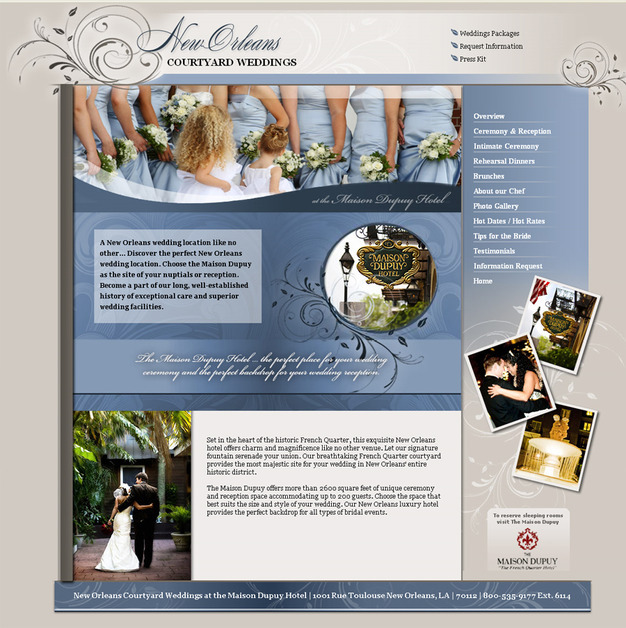 This is a screenshot from NewOrleansCourtyardWeddings.com sight, showcasing Exquisite New Orleans Weddings in a French Quarter Courtyard.